Thank you Value Village for partnering on this post and graciously coordinating a shopping excursion to my local Value Village to score some finds in honor of National Thrift Store Day! 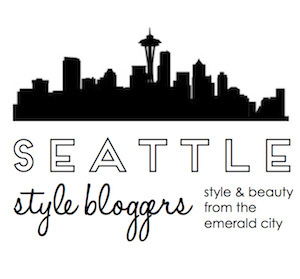 Affiliate links are used throughout this blog. Thank you for supporting Story of My Dress! All opinions are my own! Aritzia Wilfred Top thrifted! | APC Denim Cutoff Shorts (DIY, similar) thrifted! | Jimmy Choo Kitten Heel Pump thrifted! | Moorea Seal Anniversary Tote c/o | Cole Haan Aviator Sunglasses | BZR Amethyst Sunglasses | Target Faux Fur Jacket (similar) thrifted! Happy National Thrift Shop Day! I've long loved the thrill of visiting a thrift store and finding that "unicorn" item. Most of my outfits typically include at least one thrifted item and on many days my entire outfit is thrifted (recent outfits featuring thrifted items: here, here here and here)! Since my early childhood days of thrifting at the local island thrift shop with my Mom to the discovery of Value Village as a teenager and all the Abercrombie and J.Crew I could fill my cart with (at a fraction of the cost compared to the Abercrombie at the mall on my measly summer camp counselor salary), I have always loved to thrift for not only the economical reasons, but also the environmental, fashionable and stylish ones! 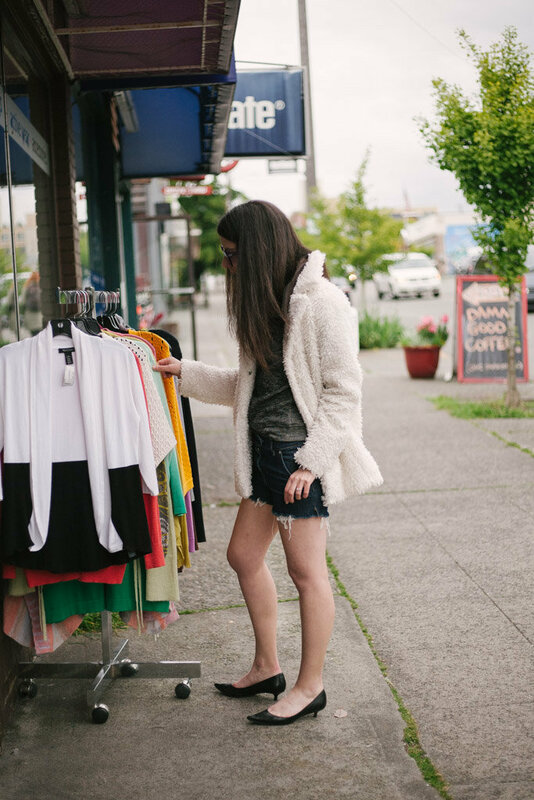 In additional to the economical and environmental impacts of thrifting, shopping secondhand also provides unlimited opportunities for creating unique outfits and discovering vintage and designer fashion. Whether it's finding that vintage band tee from the 70s or a designer item from a sold out past collection, there's just nothing like the thrill of the hunt (and the find!) for these treasures. My vintage Bottega Veneta Bag, Chloé sunglasses, vintage Levis, Rag & Bone Boots and favorite vintage Tees are some of my favorite items in my closet, and all are thrifted! 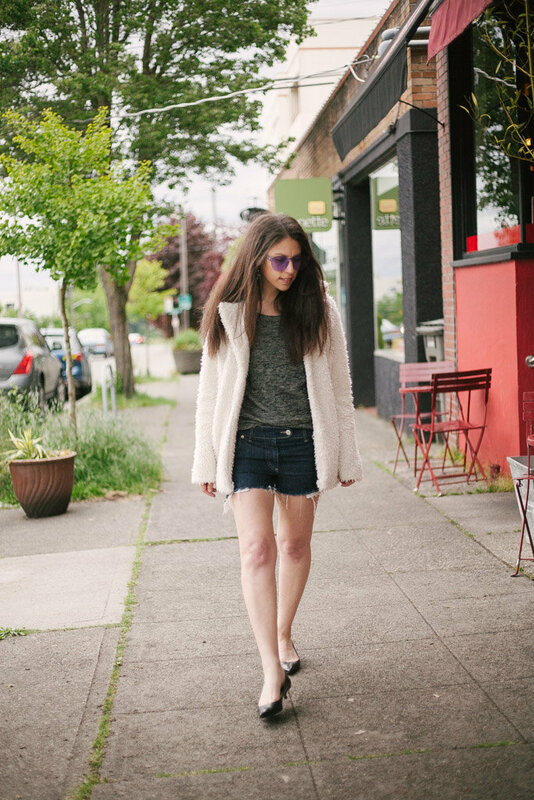 In fact, almost the entire outfit I am wearing in this post is thrifted! That Aritzia Wilfred top? Found at Value Village for $3.99! Those DIY APC denim shorts I'm wearing? Yup, thrifted at Value Village! Jimmy Choo kitten heels? Thrifted! Faux Fur Jacket? Thrifted! I only added a few accessories of sunglasses (both received as gifts) and my Moorea Seal Anniversary Tote c/o. This whole outfit cost less than $100! Seriously, I love thrifting! In honor of National Thrift Shop Day, I'm heading out to my local Value Village in search of 5 items I'm pretty much always searching for when I visit a thrift store. While I might look in other departments (and I promise to share some of my favorite thrifting tips shortly! ), these are the 5 items I always focus on, especially if I'm short on time or feeling overwhelmed with a cluttered secondhand store. I adore silk in my closet. Seriously all the silk tops, dresses, shorts, skirts and pants please. But silk is expensive and typically requires dry cleaning. To save on the expense of owning of silk, I like to find silk items secondhand. Once you know what silk feels like in it's different forms (light, heavy, etc . . ), it's super easy to spot as you're combing the clothing racks. Be sure to check for holes, stains, rips, etc . . . and leave any items with these marks behind (I know, sad face), because silk can be pretty difficult to clean and not typically worth the repair costs. Again, I just adore cashmere sweaters. They are lightweight and perfect for keeping warm as temperatures drop and even layering in winter. However just like silk, cashmere is expensive. Especially good quality cashmere. I also love vintage cashmere sweaters and the thrift shop is the perfect place to pick up cashmere for a fraction of the cost. 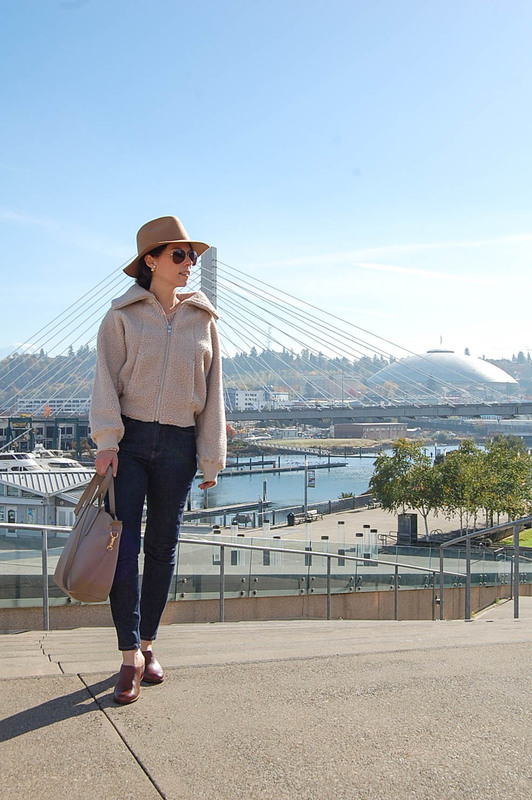 Cashmere sweaters work great both oversized and in that 90s baby-doll/shrunken style, so don't be afraid of combing all the sweater racks for that coveted cashmere beyond just your size. Again, be on the lookout for holes, stain, rips, etc which are typically not worth the repair cost (ugh...moth holes...why?!). 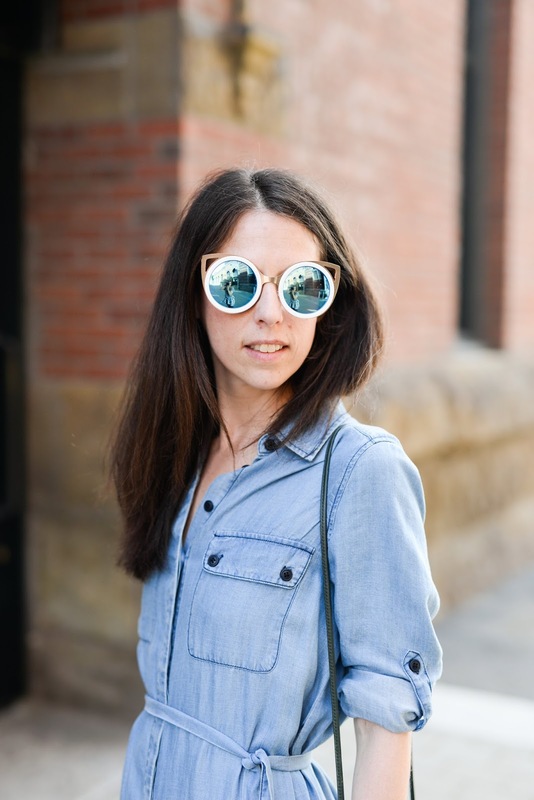 I much prefer vintage denim to that of new jeans, and am particularly fond of vintage Levis. However, I am not willing to pay the exorbitant rates that is required to typically purchase vintage denim and Levis on Ebay and at Vintage stores. As such, I am left to the hunt for my blue jeans (and jackets) at thrift stores. My favorite pair of jeans, my coveted vintage Levis 501s I found at Value Village, fit like a glove. I am pretty much convinced they ARE the sisterhood of traveling pants jeans. At less than $10, they were found pre-hemmed to my exact height. I seriously think their previous owner was my exact height/size. 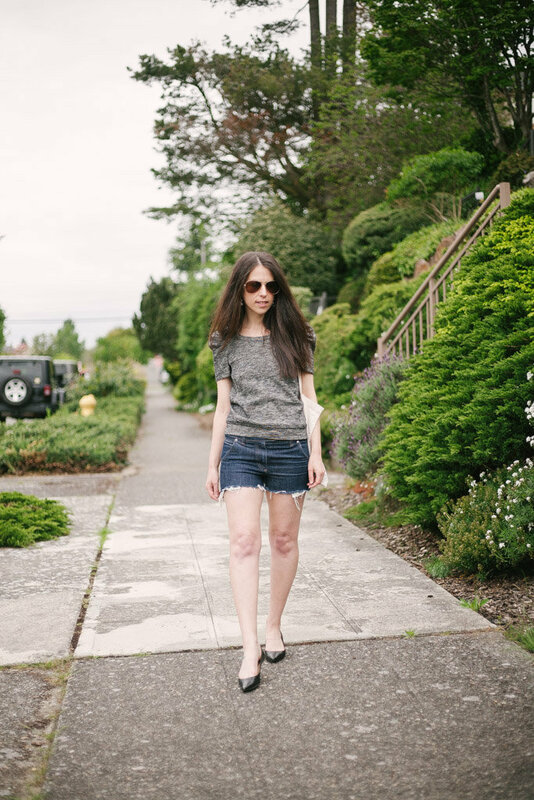 And all of my denim shorts are DIY (such as the APC pair in this post) from thrifted denim, because DIY vintage denim shorts are THE best! Similar to vintage denim, I am not willing to pay the outrageous rates required to purchase vintage tees on Ebay and at vintage stores. I much prefer the hunt and find (as does my pocketbook) for vintage tees at thrift stores. I love to comb the racks to find those uber soft and almost threadbare tees from years past with a story to tell. I am constantly looking for Grateful Dead and Crosby, Stills, Nash and Young and other 60s/70s vintage concert tees, as well as tees with a story to tell to far off places traveled. One of my favorite thrifted handbags is a leather bag I found at a small thrift shop on the California coast. I love to imagine it's story and you can see it featured in an outfit here. When thrifting I look out for handbags (and wallets, clutches, etc . . .) that are crafted of natural materials and are well made. I feel if the leather is soft, buttery and supple (if the bag is leather), the construction is intact, there are no stains/rips/holes and of course I have to like the style and design. What are your favorite items to thrift? Favorite thrift stores to visit? Feel fee to leave any thrifting tips in the comments! Yes - great post! Love thrifting too. Thanks for the inspiration. I love the outfits you are looking so stylish in this fashion trends, i really follow the article it's a good content and also totally impressed your ideas & thoughts..
Shopping is my favorite thing that I can do it whole day. I love purchasing new things and inventing new style. Though I love stylish clothes, but clutches and handbags are my obsession. Recently I have brought Crystal Clutch Bag which is amazing to flaunt with every dress. I must say, it's a must try product.